But farms, as opposed to food service establishments that exist in a local marketplace, often sell their products at a distance and even abroad, having to compete with prices from competitors paying significantly less for labor. New York Assemblyman Bill Nojay, R-Pittsford, is a strong critic of raising the minimum, believing that it will cost upstate New York 200,000 jobs. He says New York farmers are already paying an average of $12.40 per hour for workers, which is about $5 more than Pennsylvania, $4 more than New Jersey and Ohio, and over $2 more than farmers in California. 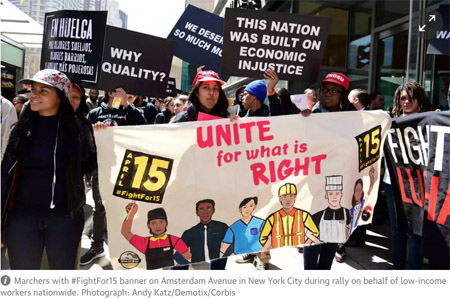 Supporters of the higher wage, however, argue that over 200,000 workers in the Finger Lakes region of New York, who currently earn $9 an hour, and 6 million Californians who currently earn $10 an hour, will have more money to spend in the local economy. And, they believe, higher labor costs will not necessarily drive up food prices commensurately. Besides, point out wage increase supporters, farm profits have increased more rapidly than wages. In 1974 California farm employers reported an average cost of $2.60 per hour for workers. That would be the equivalent of $12.49 per hour in 2014. But reported hourly wages in 2015 were in fact only $11.75. Many observers have noted that in many instances even $15 an hour may not be adequate for a real living wage. In many parts of California, because of high rents, more is required. A study by the Alliance for a Just Society completed in late 2015 found that single adults in the Golden State need to earn $19.39 to cover basic living costs. With dependents, those costs increase. 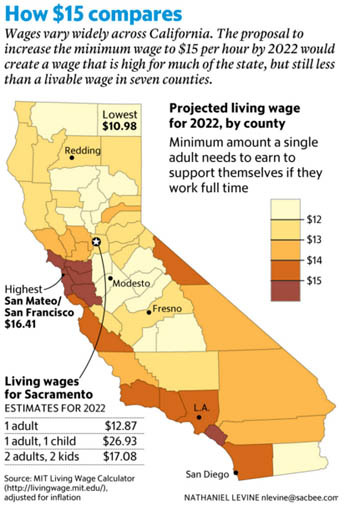 The accompanying graphic illustrates a MIT Living Wage Calculator estimate for what would constitute a living wage in various counties of California in 2022. For an adult with one child in Sacramento, the number is $26.93 per hour, or $56,000 per year. Some farmers feel that the Living Wage movement can be an opportunity for farms to achieve higher prices. They believe we should ally with farm and food service workers to make the case for economic justice for all of us involved in feeding America. Given that 84% of existing farms are in debt, that the USDA calculates farm incomes are dropping significantly, and that fewer organic farms and organic acreage exists in America than existed 7 years ago perhaps, these folks reason, our future would be brighter if we joined forces with a movement which is making economic and political gains. In this issue we explore that idea.